A student is admitted on the basis of former records, placement test, pastoral reference, principal recommendation (for new students), parent/school agreement (signed by parent and administration), and the parent's willingness to cooperate fully with philosophy and standards set forth by the school. Entrance tests will be given to applicants periodically during the spring and summer. Student's status will be reviewed yearly and the student will be re-admitted on the basis of academic progress and disciplinary record. Students entering K4 classes must be four (4) years of age by September 1 of the school year for which they are enrolling. Kindergartners must be five (5) years of age by September 1 of the school year for which they are enrolling. 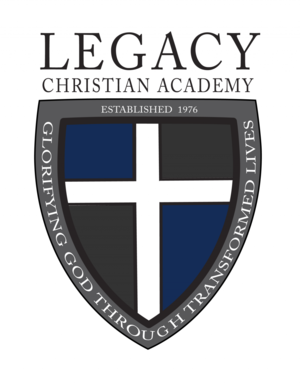 First graders enrolling for the school year must be six (6) years old by September 1 of the school year for which they are enrolling or have completed Kindergarten at Legacy Christian Academy. Admission is not determined on the basis of race, color, creed, gender, or national origin.